The launch of NASA's $1.5 billion Parker Solar Probe mission to the sun was delayed 24 hours due to a last-minute glitch with its Delta IV Heavy rocket (shown here) early Saturday, Aug. 11, 2018. The probe will now launch no earlier than Aug. 12 from Cape Canaveral Air Force Station, Florida. NASA called off the launch of its ambitious Parker Solar Probe mission to the sun just minutes before an early-morning liftoff Saturday (Aug. 11) due to a glitch with the spacecraft's giant Delta IV Heavy rocket. 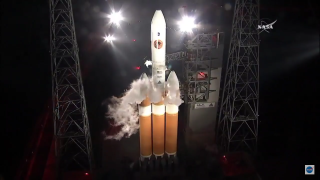 The space agency scrubbed the launch due to a last-minute anomaly in the United Launch Alliance Delta IV Heavy rocket sheduled to launch the Parker Solar Probe at 4:28 a.m. EDT (0828 GMT), NASA officials said. The mission is now scheduled for no earlier than Sunday, Aug. 12, at 3:31 a.m. EDT (0731 GMT) during a window that will remain open for 65 minutes. There is a 60-percent chance of good weather for a Sunday launch, according to ULA. "The team received a gaseous helium red pressure alarm that kicked them out," Mic Woltman of NASA's Launch Services Program said during live NASA TV commentary following the launch scrub. "The team is evaluating that and looking at it." Woltman added that the team is hoping for a 24-hour turnaround. "That is contingent on the detanking process," he added, referring to the procedure that will address the helium pressure anomaly. If the process doesn't go smoothly, the team will be looking at a 48-hour turnaround and launching early on Aug. 13. NASA's $1.5 billion Parker Solar Probe mission will attempt to fly closer to the sun and faster than any other spacecraft in history. The spacecraft is designed to fly through the sun's super-hot outer atmosphere, called the corona, to study the solar wind and sun storms. The mission is named after famed solar scientist Eugene Parker, and is NASA’s first to be named after a living person. Saturday's launch-stopping anomaly came after a second issue during today's attempt. During the original countdown procedure for the planned 3:33 a.m. EDT (0733 GMT) launch, mission control staff held at T-4 due to anomalies in data being provided by the rocket, but had then indicated they would still attempt the launch. NASA initially aimed to launch the Parker Solar Probe on July 31, but the agency and ULA repeatedly pushed the liftoff back to allow time to resolve issues with the mission's Delta IV Heavy booster. The launch window for the mission currently closes on Aug. 23.